The Bouncepad enclosure secures an Android device to a specific website or application. As of 2014, fitness application usage was growing 87% faster than overall app markets.1 As such, fitness applications, smart electronic fitness devices, and online fitness programs have become prolific. Android, Windows, and iOS tablets, and the emergence of tablet kiosks are some of hottest ways in which we see existing technologies entering the brick and mortar fitness scene. Here are a few examples of tablet kiosk deployments by the fitness club industry. As gym members look for better ways to manage their group fitness activities, gyms often develop applications for members to sign up for group fitness classes, reserve a spot, or check on available classes. Tablets can be used as a gym kiosk set to access the group fitness schedule, allowing users to sign up for classes and check the schedule while in the gym, as well as pay for classes in advance if they are not members. Virtual calendars can also assist in setting personal training schedules, scheduling nutritionist consultation sessions, or viewing other gym activities and offerings that may or may not require registration. If an application is available for personal device installation, the same application can be used in single app mode on an Android tablet kiosk. From the kiosk or a personal mobile device, members can plot their exercise plan, change upcoming schedules, and register for upcoming events and classes at the gym. Gym attendees can register and schedule personal training sessions and yoga classes from the registration kiosk, simply and easily. Just about every business and industry needs some type of system from which to gather feedback. Fully customizable customer satisfaction survey apps abound. Traditional paper methods of survey taking and opinion processing can be slow and cumbersome. Traditional methods can also be less accurate due to a time lapse between the giving of feedback and the actual feedback being received and reviewed. Tablet kiosks can be a great way to instantly acquire customer feedback at the gym. Online surveys are a quick, easy, fun, and accurate method for capturing customer responses. For members that electronically track and analyze their own activities and records, the tablet-driven fitness kiosk can be an additional convenience. Gone are the days of notebook and pencil for tracking gym activities. With fitness kiosks, visitors can log into the kiosk, record their workout stats, and analyze their entire fitness portfolio all at once. Kiosks can be installed at each exercise station as well as a centralized location within the gym. With the low cost of an Android tablet, kiosk system software, and the tablet enclosure, adding multiple tablets can be both cost effective and worthwhile, creating a truly cutting-edge, high-end fitness experience. In an even more upscale version of this setup, members could carry around gym-provided purposed device tablets, knowing that personal data would be cleared between users and only allowed activities would be accessible on the device. Bulletin boards are a common sight at the front entryways of many gyms and fitness centers. These can carry all types of notices from employees, local businesses, fellow gym members, and local event organizers. In order to clear up this space aesthetically, yet still provide the information accessible via a bulletin board, a tablet kiosk programmed to act as a community bulletin board can be the ideal solution. Lost and found items at the gym, upcoming events, daily activities, gym specials, referral program information, weight loss meetings, new equipment announcements, staff introductions, and more, can be added to the interactive electronic bulletin board. If this seems to be a popular feature, setting up several kiosks for this purpose at the entrance to the facility could increase awareness and participation. For those wanting to present visitors and members with the first impression of a modernized, technologically advanced facility, this is an exemplary commodity in entryway presentation. Gym members love being treated to the best in modern technology at workout time. Kiosks are a perfect item for setting a tone of modernization and overall quality of the gym. Kiosks can allow gym visitors to fill out membership forms, sign up for classes, submit customer satisfaction survey answers, track their fitness activities, and find new fitness routines, meals, or activities to try at the gym or at home. All of this can be accomplished with little to no custom development and secure kiosk system software. 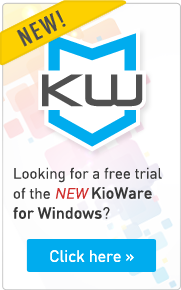 Learn more about how to secure your Android tablet with KioWare for Android. Need custom development? Try our custom development worksheet to quote your custom dev project. 1 TechCrunch. Russell, Kyle https://techcrunch.com/2014/06/19/fitness-app-usage-is-growing-87-faster-than-the-overall-app-market/ (2014-06-19).